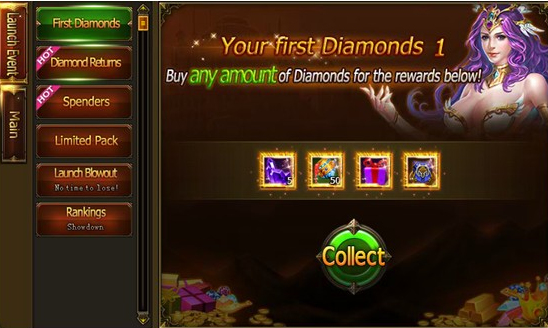 Description: Purchase any amount of Diamonds for the rewards below! Duration: Lasts for a week after the new server launch. 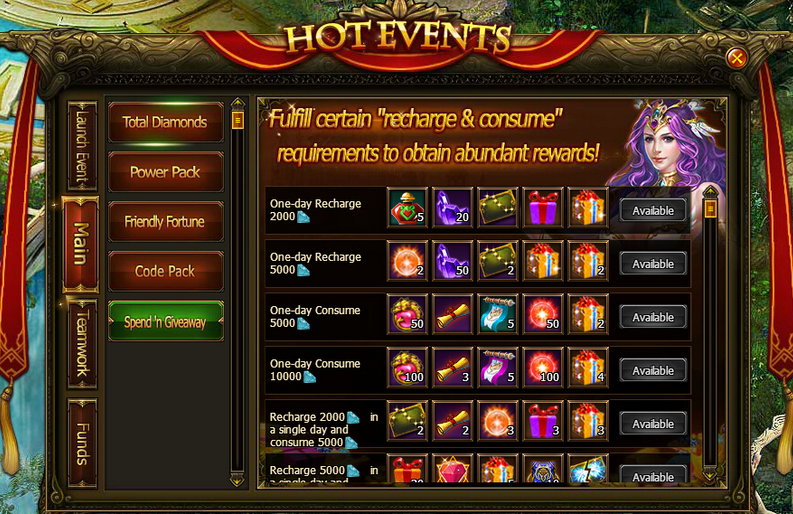 Purchase any amount of Diamonds and receive the event rewards! 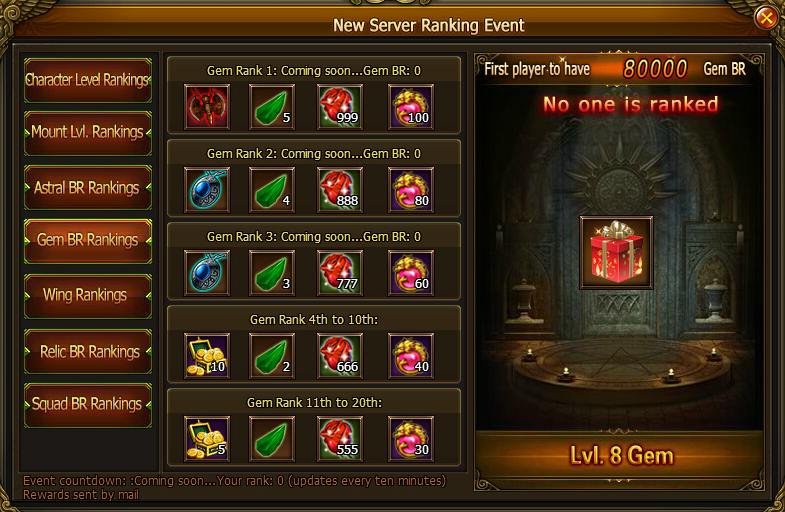 Event resets at 0:00 (Server Time) and players can purchase more Diamonds for additional rewards! Uncollected rewards will be sent via in-game mail. The rewards vary each day of the week. Description: Get enough Diamonds to reach the targets and receive great rewards. Purchase 10,000 Diamonds to get all rewards! Duration: Event is split into two sections: Days 1 - 3 and Days 4 - 7. Description: During this event, the top spenders on the server will receive bonus rewards, including mounts, outfits and various gems! All players start with 0 Diamonds. The more players spend, the higher they climb on the spenders board! 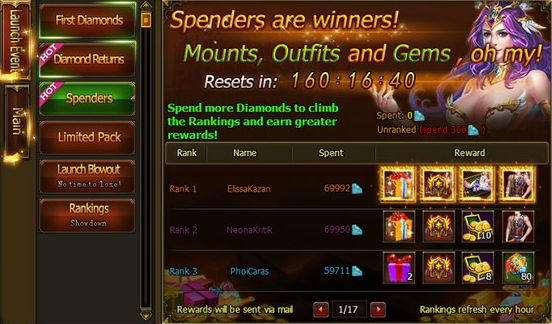 If two players buy the same amount of Diamonds, the player who made their purchases first will rank higher. 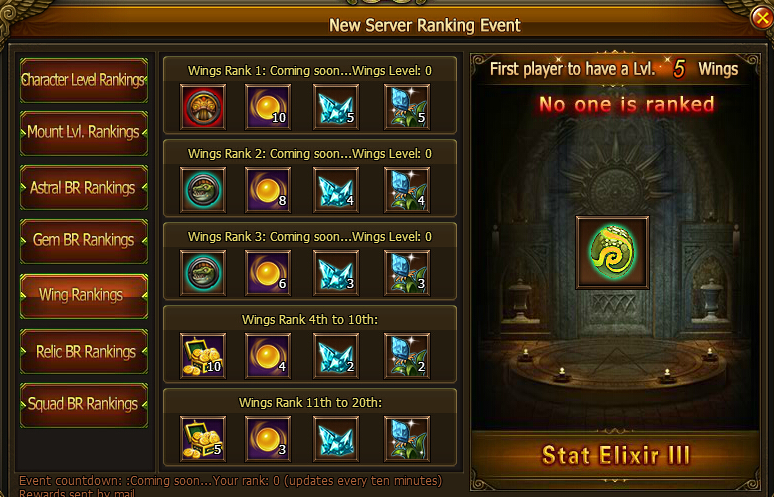 Players Rank 1 – 50 are shown on the leaderboard. 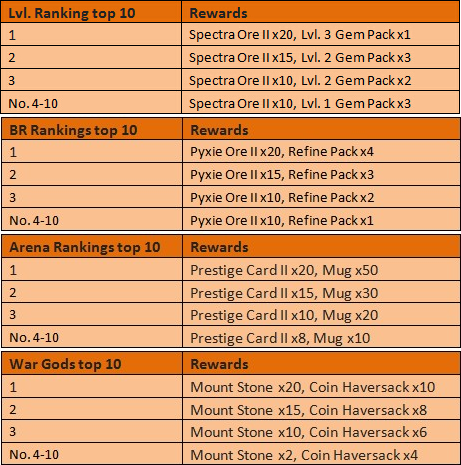 There are five tiers of rewards: Rank 1, Rank 2, Rank 3, Rank 4 – 10, Rank 11 – 50. Rewards can be collected on Day 8. Uncollected rewards will be sent via in-game mail. 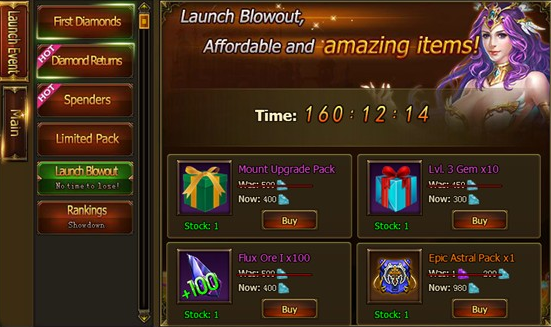 Description: Effortlessly increase your BR by purchasing and using these special packs! There are 4 Limited Packs currently on sale! Packs can only be purchased with Diamonds. Packs are limited and cannot be purchased once they run out! Available packs reset every day at 0:00 (Server Time). Description: Purchase various items for special and very affordable prices! Description: Rise up, hero! Real warriors fight until the end! 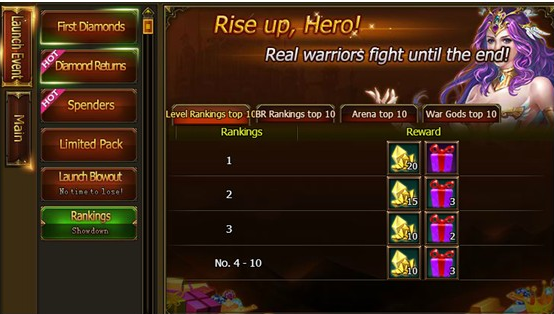 Rewards are given based on players ranking in Level, BR, the Arena and War Gods. Rewards are sent to the top 10 players at the end of the day! 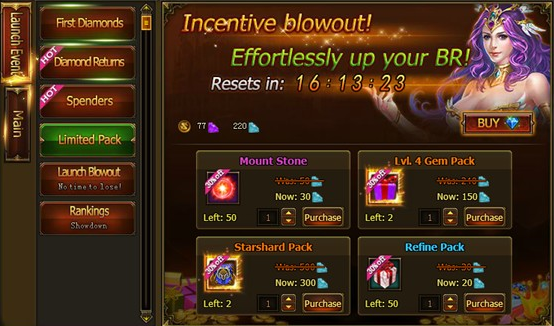 Description: Exclusive rewards await! 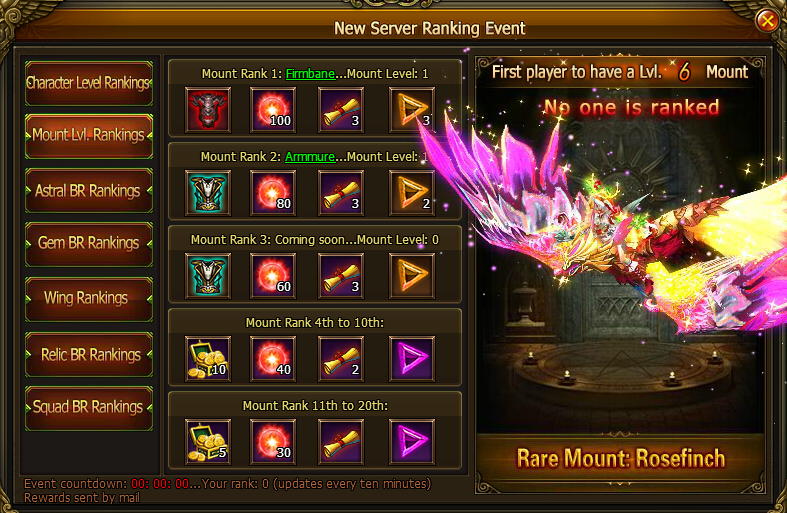 Rank up in Level, Mount, Astrals, Gems, the Vault, Roses and BR to be handsomely rewarded! Players may also purchase special packs, max 3 per player. 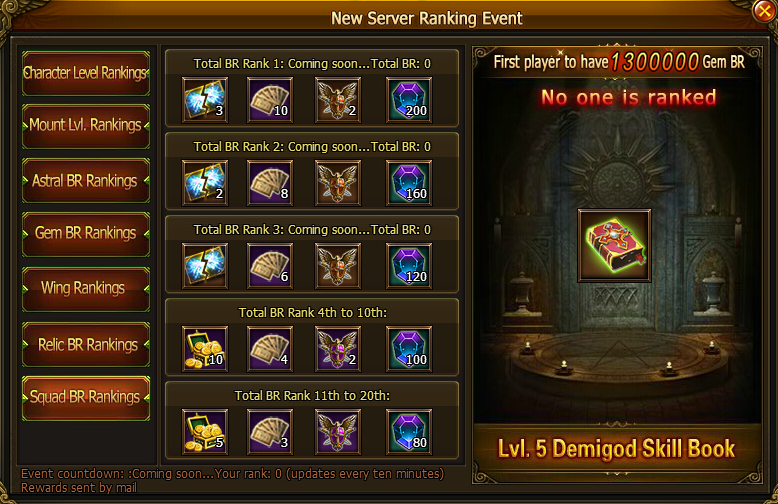 Duration: Daily ranking events will be held during the 7 days after launch. Events only last for one day. 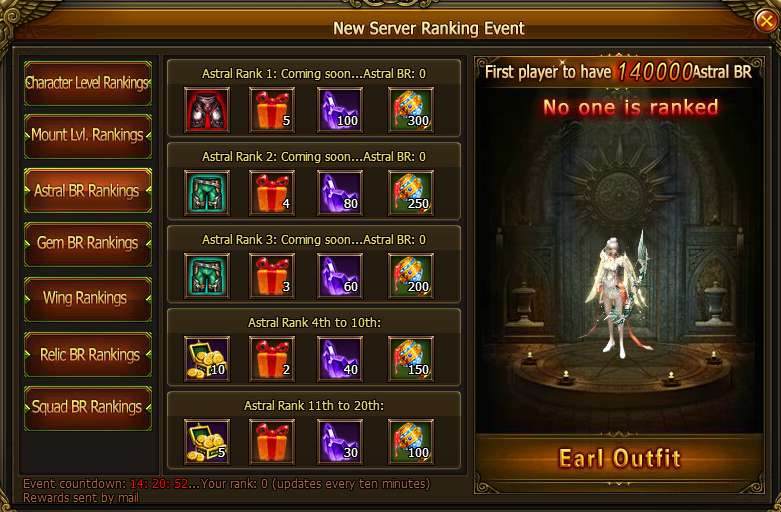 Duration: Lasts for a week after a new server launches. Description: Players who get married during the event are eligible for extra rewards. 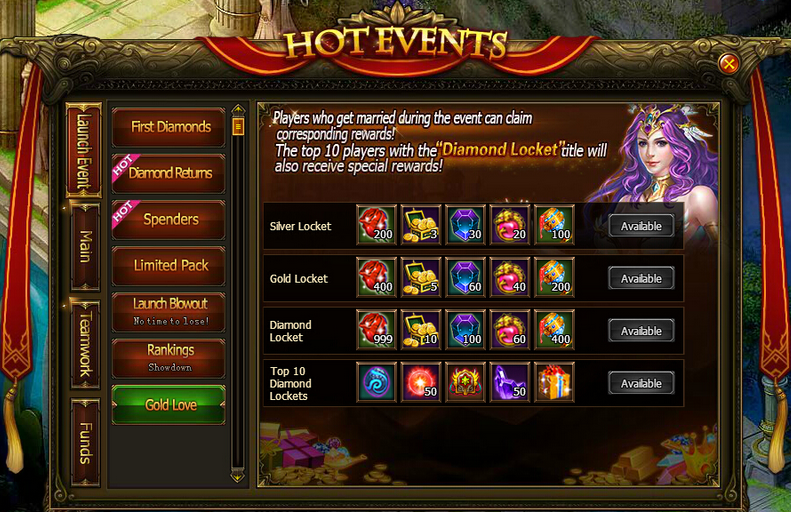 The top 10 players with the 'Diamond Locket' title will receive additional special rewards. Please note that players who meet the requirements will only be able to collect each of the rewards once during the 7 days. 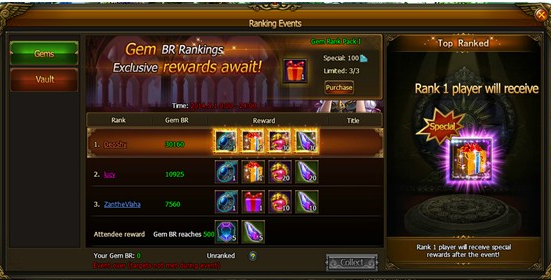 Description: Players will be able to collect certain rewards depending on their Character / Mount / Astral / Gem / Wings / Relic BR / Squad BR Rankings. - In each of the Rankings, the top 3 players’ names will be displayed, and up to 20 players will be eligible for the other rewards. 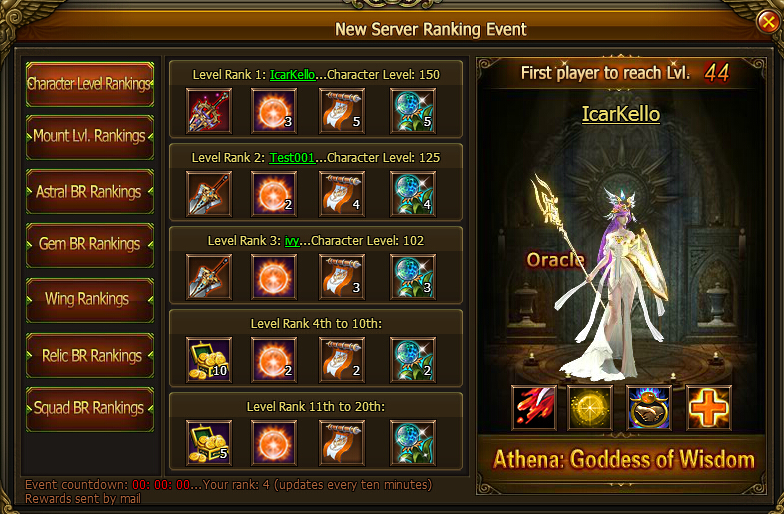 - The first set of rankings (Character Level Rankings) opens in the 24 hours after the first day of a server launch; the second (Mount Lvl. Rankings) opens in the 24 hours after the second day of a server launch; … the last (Squad BR Rankings) opens in the 24 hours after the seventh day of a server launch. - Ranking data updates every 10 minutes. Rewards will be sent via in-game email at the end of each and every ranking event. - All 7 sets of ranking data will be kept until the end of the last Squad BR Rankings event. Duration: Lasts for a week after a new server launch. Description: Fulfill daily "recharge & consume" requirements to obtain abundant rewards! - “Recharge and Consume” data resets daily. After reaching the requirements, you can collect your rewards at any time during the 7 days while the event is still going on. - Uncollected rewards will be sent to your in-game email at 24:00 the same day. 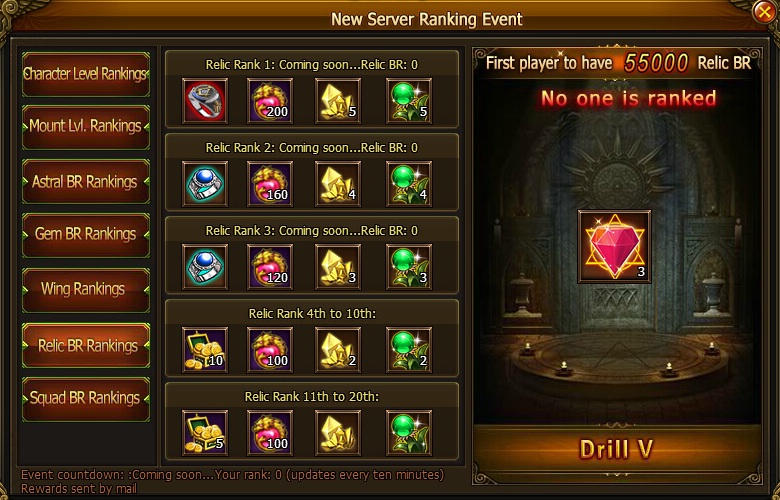 - The rewards for the first 6 days after a server launch are fixed; however, you can collect better rewards on the 7th day after a server launch. Check the Requirements & Rewards for this event as below.